Ally Martinez had begun to doubt she would ever find an eligible cowboy. In the small-parts aisle of Cowboy Creek Hardware and Feed, she knelt on the unvarnished pine flooring and tried to keep from muttering aloud. After all these years of separating nuts from bolts from washers, hauling bags of feed and restocking spools of twine, she was still as unattached as the day she had begun working here. It wasn’t as if she had taken the job after high school specifically to find a man. It wasn’t even that she was eager to get married—or to have a brand-new baby, the way her best friend, Tina, had just done. Babies and she didn’t get along. At the touch of her hand, they somehow read her inexperience and knew they didn’t want to have anything to do with her. No, it wasn’t any of the above that made her long to find a cowboy. She simply wanted someone special in her life. 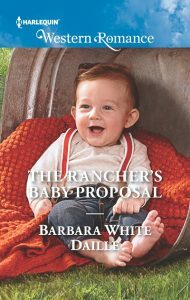 And lucky for her since she lived in ranch country, she had always been partial to men who looked good in jeans and a Stetson. “I sure hope that little one doesn’t pick up any of your sauciness, young lady.” Even as Tina’s grandfather pretended to scowl at her, he laughed. They knew each other well. In his seventies now, Jed Garland had semiretired but still oversaw the running of Garland Ranch. He definitely stayed on top of things when it came to the Hitching Post, his family-owned hotel on the same property. “Well…” He would expect a teasing response. Everyone expected lightheartedness from Ally Martinez, whose senior high school claim to fame was being voted The Girl Most Likely to Make You Laugh. “I do have lots of options, Jed. I could hang out at the Bowl-a-Rama, the Big Dipper or SugarPie’s. Except I don’t feel like bowling, don’t have a taste for ice cream, and certainly don’t need any of Sugar’s famous desserts.” Grinningly wryly, she patted her “generous” hips, as Mama called them. “Of course, there’s always the Cantina,” he said. From where she stood in the aisle, she could see only the brim of a worn Stetson and the shoulder and arm of a man wearing a T-shirt as snug as her jeans. Wrapped around that biceps, though, snug looked good. Ally’s heart skipped a beat. Her thoughts began to race. Was it really Reagan, the boy who had left town five years ago and left her with a broken heart? Was she going to pass out right here in the nuts and bolts aisle of the store? What, and let him know how much seeing him again had affected her? Not in her lifetime. Instead, she called up her usual response when life threw something bad or sad or uncomfortable her way. She pasted on a smile and pretended it didn’t matter. She reacted just in time, as Reagan stepped into view and reached out to shake Jed’s hand. Reagan’s shoulders had gotten broader since she had last seen him. He’d grown taller, too. His hand looked firm and strong…and tanned. She wouldn’t have expected that from a man—a boy—who had left his hometown to go away to college in the city.